I’m not the kind of person to wear things blatantly covered in hearts on Valentines, however, small subtle heart shapes are another story! This slouch hat uses the star stitch (turned sideways) to give the illusion of rows of tiny hearts running up the sides of it. 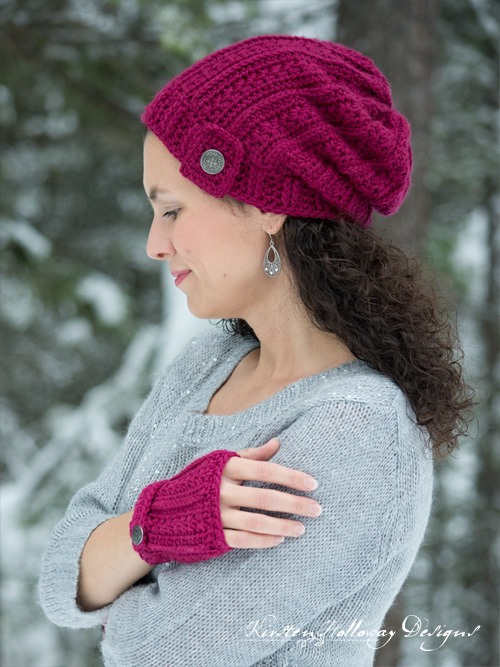 Since it is such an understated design, the Heartstrings Slouch Hat is one you’ll be able to wear all winter long–not just on February 14. 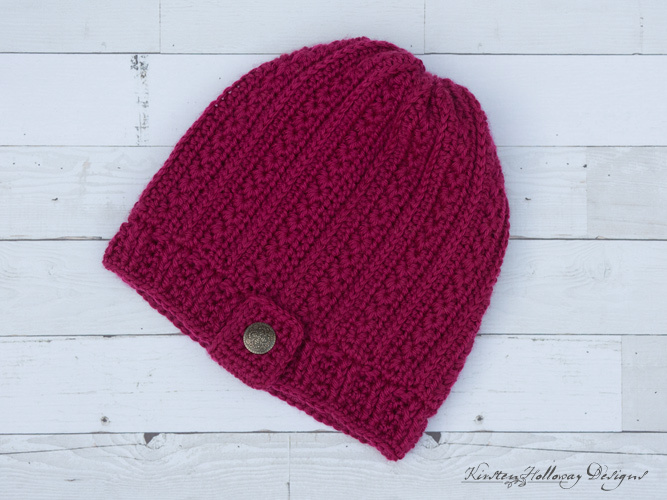 I used Red Heart’s beautiful “Soft” yarn in “Berry” for this project. It is indeed so soft and cozy, I know you’ll fall in love with it right away like I did! Instructions for child and adult are included, but it is able to be customized to a variety of head shapes because the main part is worked in rows. 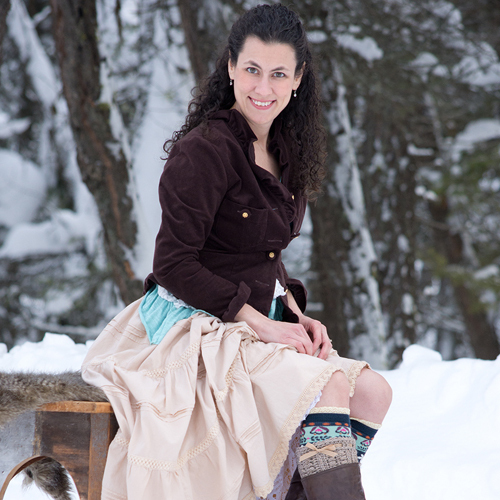 Complete the set with the matching Heartstrings Fingerless Gloves pattern! While there, you can also purchase a printable, ad-free PDF of this pattern, if you like. Stitching in the “3rd loop” of hdc. After turning, work all stitches for that row in the 3rd loop of the hdc from previous row (it will be facing you). This pattern uses the Star Stitch for rows 3 and 4. I’ve included written instructions on both rows. This hat works best when using very soft, worsted weight yarn with plenty of drape. Use of another yarn besides Red Heart Soft may give you different results. Repeat rows 2-5 until your hat measures 17″ long for a child, and 19” long for adult, then repeat rows 2-4 one more time. Your hat should measure about 18″ long for a child, and 20″ long for an adult, by 7 1/2″ tall for a child, and 8 1/2″ tall for an adult at this point. Pull up a 24″ tail, cut yarn, fold hat in half and use the tail to whip-stitch the two ends of the hat together, forming a circle. If you use this method your seam should be invisible. Attach yarn to the end that is the smoothest, this should make your “hearts” go the right direction. Double check that this is the case before you move on with the next step! Cut a strand of yarn at least 24” long, thread on to your yarn needle (a double strand makes it easier to cinch the top of the hat without breaking the yarn), and do a running stitch around the top opening, and cinch it together snugly. Tie off, and weave in the ends. Turn hat right side out again. To finish, sc around the edge of the rectangle, fasten off leaving an 18″ tail for sewing the tab to the hat. Wrap button tab around the brim, over the seam, and sew it on, then sew on button. Thank you so much for stopping in! You can also find me on Facebook, Pinterest, Instagram, and Ravelry. Friends, if you enjoyed this pattern, don’t forget to sign up for my newsletter! That way you’ll never miss out on special events, or freebies I’m offering. You are welcome to share the link to this pattern, using one image of your choice, on your site, but please do not share the written patterns themselves, or use additional images. If you sell finished items online, please do not use my pictures for your listings. I’m positive that your work is of high enough quality for you to sell the finished piece. Have confidence in your abilities! <3 Thank you! This pattern was made to be used by individuals, and small business crocheters alike. Selling your finished pieces in boutiques, at farmer’s markets, craft shows and other events is encouraged! The only thing I require is that it not be used commercially to produce millions of copies. This post contains affiliate links. When you purchase something using these links a small amount of the sales price goes to me. You do not pay any extra for the item you purchase. How cool is that?! Beautiful hat pattern! I did not notice before, but I love the idea of the sideways stars to be rows of hearts. Great idea! Do you have a newsletter you send out. Your designs a Beautiful! I don’t yet, Kim, but hope to get that set up sometime in the next few months! I’m glad you are enjoying the patterns! Help!! When I do the pattern as written my raised row, from working in the 3rd loop, is not on the same side as my star stitch. Am I missing something? Hi. I would really love to learn this new pattern but having trouble with row three ” pull up loop in back of second chain, pull up another loop in the side of chain”. Could you help me with this by describing which chain and where it’s back and side are. Thank you! This is describing the beginning of the row, right after you ch 2. You’ll pull up a loop in each of the designated spots on the second chain from your hook. YouTube has some great videos that show how to do the star stitch, so if you’ve never worked it before, it might be helpful to watch how the stitch is done. 🙂 It’s really easy once you get the hang of it! Good luck! I am having the same trouble. After the initial first star stitch the rest I understand, but it’s the very first one that makes me confused. Are you talking about the 2 chains you just made, or the chains in your row? I’m assuming the back of the chain means the back bar, but what is the side of the chain? I tried finding youtube videos but they all start like how the pattern says to do the second star. Lovely pattern! I was wondering though, if you meant for the first stitch on row 2 of the brim to be FPDC instead of FPHDC. Just wanted to double check. I love the textural qualities of this hat. Unlike any others I’ve seen so far! Thank you! The stitch is supposed to be a FPhdc on both rounds 1 and 2. I’ve updated the instructions! Very pretty and feminine hat. I plan on making a few for Christmas 2017 gifts. I know the ladies will love them. Thank you for your generosity with the pattern. I love your patterns. Thanks. Hope you have a Merry Christmas. Thank you, Janice! Merry Christmas to you too! I’m going to use the stitch pattern to make a bolero shrug for s friend. Ok! Good luck in your project! What is the multiple doe the pattern? I’m using a slightly heavier worsted yarn and a 6mm hook, so I don’t think I will need to chain 36. What can I drop down to?